Last year when I reviewed the ZenBook 3, I couldn’t quite make up my mind as to whom the device was targeted towards. The lack of dedicated graphics didn’t make it the ideal workhorse, however, the multimedia viewing experience was quite rich. Then again the question arose as to whether it was worth the exorbitant price to just suffice as a media device that packed desirable looks. Almost like an answer to my queries, Asus launched the Vivobook S510 and I must say, throughout my time with the device it really did plaster a smile on my face. Let’s get the specs out of the way, shall we? The Vivobook packs the 8th generation Intel i7-8550U (Quad-Core) which is a mobile processor with passive laptop cooling. This beast gets a Nvidia MX150 and 16 gigs of ram to boot, and all without compromising on a solid metal chassis which is thin as well as thermally efficient. There is a backlit keyboard included with very good feedback and a stellar Full-HD IPS panel with minimal bezels, just like the ZenBook 3. The device gets 3 USB Ports out of which only one is 3.0. A USB-C port that’s only capable of data exchange is included along with an HDMI out. Windows Precision track-pad comes standard with a fingerprint sensor that’s paired with Windows Hello that puts most phones to shame. A 1TB HDD is included along with a moderately fast 128 GB SSD. Overall for INR 82000 (approx. 1300 USD), this PC is packed to the brim with specs and functionality. Performance is on point with the Vivobook. All points considered, this isn’t a gaming device; however, the dedicated graphics paired with the latest Kaby-Lake chip makes video editing and rendering a breeze with enough RAM to spare for multitasking. The dedicated graphics have enough steam to pull off almost all the latest game titles in a medium-setting at a full resolution and mind you this is a remarkable feat considering that this device rarely overheats in a body that almost puts the MacBook Pro to shame in terms of the functionality it packs. This device will rarely let you down as a primary workhorse and still packs enough oomph for the occasional game session or movie watching. The stereo speakers included are well placed albeit sounding only moderately loud. Audio through the headphone jack is great and the included sound card is capable of driving my ATH-M20X studio monitors with ease. You don’t need to ditch ports for a slimmer form factor! Battery life is where this device struggles. As long as you limit performance whilst having the power-saver mode on the battery packs enough juice to last you for the advertised “8-hour battery”. With performance on max while gaming, (even at 40 percent brightness) the device loses its juice in under 3 hours. This is something that Asus should look to optimise and it is the only flaw holding the device back from completely thrashing the competitors in this segment. Truth be told, this is a miracle device! It packs everything the average YouTuber or College Student requires and then some more. A 15.6-inch screen in the body of a 13 inch MacBook Pro with dedicated graphics, a better keyboard, more versatile selection of I/O, and an almost 40 percent price reduction makes this device an almost no-brainer to purchase for the target audience. 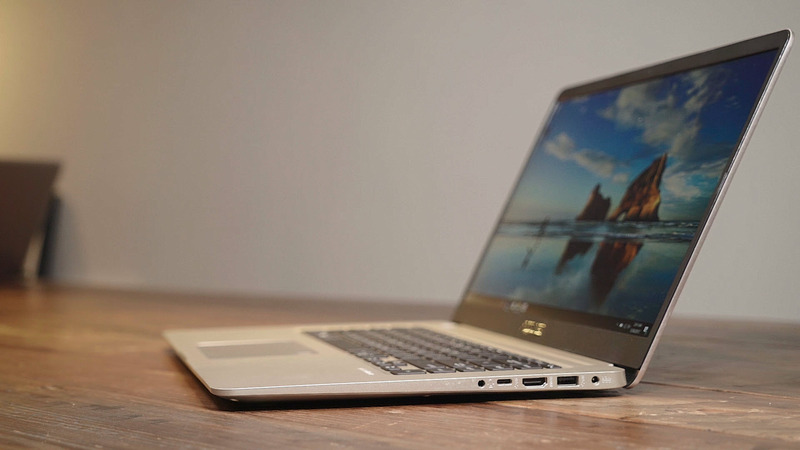 Just be wary of the battery life and you’ll have an enjoyable experience with the Vivobook S510. Asus has succeeded in building up hype for their next iteration of the Vivobook and I’m looking forward to it with a lot of expectations! Med-Student with a huge passion for tech. Excited yet? Next article Is The Asus Zenfone Max Pro M1 the new budget king? Win a Carved Case from Carved.com and KTTN! Iris vs Fingerprint Scanner | Samsung Galaxy Note 7!